Working Remotely? Try THE BEST APPS for Remote Work & Freelancing! 19 Feb Working Remotely? Try THE BEST APPS for Remote Work & Freelancing! Your business is growing and you’re adding employees! However, not all of your new hires need to report to the office – and some kind of jobs, such as regional sales – pretty much require field work. Telecommuting is becoming more desirable for employers as well as employees for such reasons as greatly reduced overhead. According to The 2017 State of Telecommuting in the U.S. Employee Workforce Report, companies see an average of $11,000 annual savings per telecommuting employee. The report was produced by FlexJobs and Global Workplace Analytics, focusing on full-time employees who work from home at least half of the time. As one of the major findings from the report is that the number of people telecommuting in the United States increased a whopping 115 percent in the last 10 years, you may be taking a serious look at which of the vast array of apps for remote work are best suited for your business and the way you want your team members to collaborate. 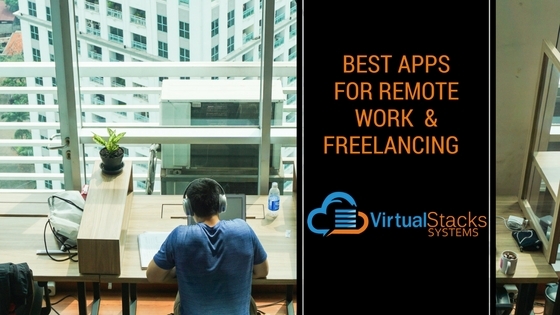 Whether your remote team consists of full-time, part-time or freelancers – or any mix thereof – Virtual Stacks Systems has rounded up the apps for remote work that consistently top the experts’ lists, so you don’t have to! Thanks to HubSpot, Inc., Skillcrush and eServe. We also reached out to owners of home-based businesses, who provided their valuable input. The Best Apps for Remote Work & Freelancing! Asana – Project management app that allows you to create and delegate tasks; organize tasks into shared projects, chat with team members within each task; and add attachments from Box, Dropbox and Google Drive. It also includes calendar features, project dashboards and to-do lists. Box – Enterprise-friendly tool provides secure file sharing, storage and collaboration, while offering solutions for a wide variety of business needs. Dropbox – Ideal for exchanging files that are too large to send via email; collaborative work and backups; allows easy access and sharing of folders. Especially useful for organizing freelancer work. Evernote – Popular notebook and productivity program that functions as a paperless office; integrates very well with many other productivity apps. GoToMeeting – Easy, intuitive connectivity for video conferencing. GitHub – Powerful tool for web developers to build software with remote teams. Features include code review and management for open source and private projects. GitHub Wiki allows you to share your work with the rest of the GitHub community. Employers can also use it as a company resource for employee onboarding that organizes information for new hires. iDoneThis – Team progress tracking software that provides easy daily check-ins and powerful progress reports to run more effective and productive teams. Compiles individual responses into a digest and distributes it to all team members. Signal – Open-source, free encryption software that allows you to communicate instantly while avoiding SMS and MMS fees; create groups so that you can chat in real time with all team members at once; and share media or attachments – all with complete privacy. The server never has access to any of your communication and never stores any of your data. Slack – Allows real-time, on-on-one communication with everyone on your team. Chats can be organized by subject, and integrates activity from GitHub, Trello and other applications. Allows communication to be defined by client or team, so that only those in a specific group will be included in conversations. Another fan of Slack is John Jonas, owner of Onlinejobs.ph, a website that helps business owners who want to outsource to Philipino virtual assistants. Time Doctor – Time tracking software that provides detailed analytics of where time is spent in the work day. Time Doctor is a web-based solution that provides time tracking, productivity monitoring, computer work session monitoring, reminders, screenshot recording, invoicing, reporting tools, third-party integrations and more. Trello – Elegant in its simplicity, this project management tool is based on a system of cards and project boards for making notes on what needs to be done and who should be assigned to the task. Has been described as a team post-it-note board on steroids. Wunderlist – A tracking and scheduling program for personal to-do lists and client work. Allows task management from a smartphone, tablet, computer or smartwatch. One parting thought: According to The 2017 State of Telecommuting in the U.S. Employee Workforce Report, telecommuting exceeds public transportation as the commute option of choice in more than half of the top U.S. metro areas – growing far faster than any other commute mode. Finding the tools that deliver the best results for your remote workforce is now more essential than ever to achieving success!